The importance of hygiene in the workplace simply cannot be overstated. Businesses in the hospitality industry pretty much depend on high hygienic standards, but other companies can also benefit from a tidy and germ free workplace. 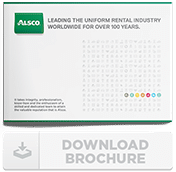 Alsco provides support to companies which strive to raise hygienic standards in their washrooms, with much more than just supplying them with proper equipment. Alsco’s industry experts actively participate in choosing the best solutions for each particular client. The advice those experts provide relates mostly to two aspects of restroom organization – practical facilities and design. This article will be dealing with both aforementioned aspects. First it will discuss the practical aspect – the necessary equipment every good washroom needs to have – and then it will deal with washroom design and proper set up. Hand Sanitisers – The hand sanitiser is a valuable addition to efforts to keep hygiene levels up, but it is important to note that they should be used in addition to soap and hand drying systems. The reason is that sanitising sprays only kill the transient bacteria that sit on the surface of the skin. More threatening bacteria lie just under the surface and can be got at more effectively by soap. Hand Soap Dispensers – Soap is still by far the best solution for hand washing. Soaps have been around for a long time and as technology progresses they keep getting better and more efficient. Today’s best solution is certainly liquid soap or similar varieties such as foam or spray soaps. Soap bars, while equally efficient in fighting against germs, tend to be frowned upon in public washrooms because dirt accumulates on them, creating an image that is not very pleasant to look at. Hand Dryers – There are a three methods of drying hands in the workplace restroom: cloth roller towels, electric hand dryers, and disposable paper towels. But not all of them are hygienic. Electric hand dryers are certainly effective in getting hands dry, but studies have shown bacteria levels actually increase by up to 194% on finger pads and 254% on palms. Modern jet air dryers, meanwhile, can spread contamination a distance of up to 2 metres . Disposable paper towels are a much more hygienic option, with bacteria reduced by 76% on finger pads and 77% on palms . But perhaps most crucially, being disposable makes the risk of contamination negligible – as long as the bins are covered properly. The cloth roller towel is highly effective too. Since cloth towel dispensers are closed, the used section of a roller towel is out of reach, reducing contamination dramatically. A study in 2007 found that with cotton roller towels, bacterial levels fell by 85% on the hands. Once both practical and design aspects of your washroom are dealt with, it would be a mistake to think the work is done. 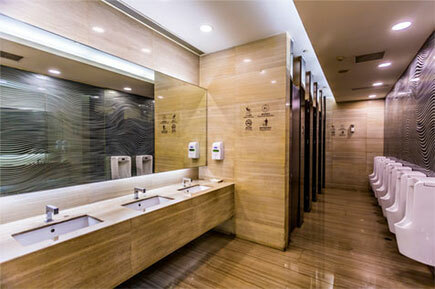 Washroom maintenance is an equally important aspect which needs to be taken seriously. For this reason, it would be wise to appoint a facilities manager, a member of your staff whose duty would be to control the state of your washrooms and take care that everything is in perfect order.